rec. 10-13 December 2013, Skywalker Sound, Marin County, California. Robert Erickson is another of those composers who alas has flown under the radar and remains little known in Europe, although he is remembered with affection in the US as a significant artist as well as teacher to the likes of Pauline Oliveros, Terrr Riley, Morton Subotnick and others. 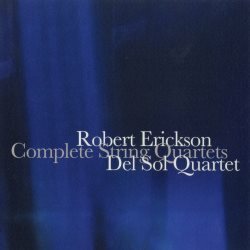 New World Records now has a number of fine releases of his orchestral music, but this elegantly designed 2 CD set brings us his complete string quartets – a set of works reflecting Erickson’s evolution as a composer from the beginning and end of his career. The String Quartet No. 1 is an an early work, its academic conventions of counterpoint indicative of rich craftsmanship but revealing little of the more personal voice which would later emerge. The words ‘intellectual’ and ‘process-orientated’ are bandied around in summing up the work in the press release for this recording, and this is a fair assessment. There are some sections which recall Bartók as if by accident, the rigour of the contrapuntal technique keeping true flights of passion and excitement enough in check to keep our emotions from clicking into high gear. Erickson was nearly forty years old when his String Quartet No. 2 emerged from an arid creative period, and is seen as a breakthrough which informed his future direction. This is a single-movement work which strikes out into expressive realms entirely different from No. 1, taking us on an extended and intensely detailed journey. Each moment contains its own microcosm of imaginative musical gesture: at times meditative, conversational, energetic and then in repose – each musical paragraph shifts relentlessly to the next with a restless impetus which gives us the feeling that the composer almost has too many ideas to fit into just one piece. The expression can be lyrical and abstract at the same time, the pulse more that of inhalation and exhalation of tensions and relaxations rather than a driving rhythmic urge. It is tricky to point out particular moments – the atmosphere of the whole is what remains in the memory, its power held in the collective nature of its impulse rather than moments of striking beauty or climax. With CD 2 we have named rather than numbered works, and products of the late stage of Erickson’s career not long before he was rendered inactive due to debilitating disease. The title Solstice doesn’t indicate a descriptive programme, “there is no scenario, no plot, no image, only ears and sensibility.” This said; there is a feel of landscape and changing light in the work which is infused with unison figures and rotation around pedal tones. Silence plays a role as it did in the second quartet, but here the expression comes from pared-down essences of notes and melodic lines and fragments which lead a life of their own – tethered only by the drones of their tonal centre. Corfu had associations for Erickson with “the Greek islands and their ancient civilizations” as he worked on the piece, though he had never been to Corfu. He described the style as “bare and ‘stripped down’, though it is strongly melodic. …a piece that is directly expressive and that goes its own expressive ways.” As with Solstice there is a tendency to build around tonal centres or notes sustained and drone-like but avoiding a feeling of folk-music derivation, and indeed entering our consciousness from an entirely different quarter – that of Erickson’s imagination. There are some nice quarter-tone effects which heighten certain expressive moments, but the booklet notes by Charles Shere hit the point in summarising these late works as “contemplation of pure sound.” There is an elusive magic worked by these pieces which operates on different planes – taking away the string-quartetness of the string quartet while at the same time unfolding a sound-world which you couldn’t imagine performed through any other medium. The Del Sol String Quartet performs all of these works with expertise and convincing commitment, and with fine recorded sound this is a collection of world première recordings which deserves the attention of any collector of thoughtful contemporary music.